MI9 (Military Intelligence) was responsible for planning the repatriation of former POW�s (Prisoners of War) after the invasion of Europe. As there was some 2.1m held in camps all over Occupied Europe (mainly Germany and Poland) and made up of eleven nationalities, the problem needed careful planning in logistics as well as medical care. According to Nichol and Rennel (2002) OPERATION VICARAGE became operational effective in March 1945 and was designed in cooperation with SOE and SHAEF to be a rapid airborne force (called Special Allied Airborne Reconnaissance Force) to protect POWs from German reprisals as the war closed. However, this was not the only plan or strategy. A memo dated 29th November 1943 (PRO/HS4/225/109941) contemplated that if Germany suddenly collapsed, could British POWs in East of Germany be utilised to support the AK. It was evident at this stage of the war; the physical condition of POWs was not fully appreciated. 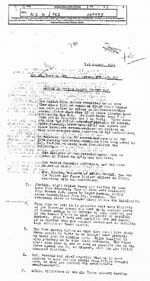 In a memo dated 29th February 1944 (PRO/HS4/229/98362 with the reference EUP/PD/5861) indicated General Sosnkowski agreed to expand the Bardsea teams in �order to form a cadre of groups to be dropped in Polish prison camps in Germany�. This cadre would be German speaking and whose orders were quite simple: free the prisoners and slaughter the local population. An additional 37 officers and men were to be allocated to S.T.S 63 for training and would recruit from Operation Monika. 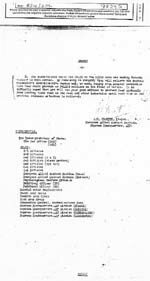 Approval for the operation was given on 11th April 1944. The operation was code named DUNSTABLE and like the Bardsea Operation would become entangled in politics and military strategy, for example SHAEF did not want freed Poles in N. France (often slave labour) to be removed from key industries, which might be important for the war effort. There were growing concerns over the number of Poles who had been forcibly conscripted into the German army and TODT organization. 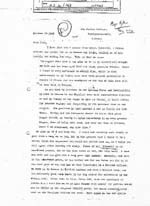 General Kukiel representing the Polish Ministry of National Defence had since December 1943 requested SOE to consider how to encourage desertion once the invasion had started. 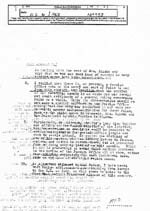 A note of protest dated 14th June 1943 (PRO/HS4/225/1109941) by Lt. Colonel Kowaleski (Polish Special Operations Office) to Lt. Colonel R. Hazell highlighted the friction and conflict between different and often competing departments. The BBC had regularly been broadcasting insurrection messages to the Poles in the German Army and TODT Organization without the Polish Government in Exile�s permission and it was felt these messages were endangering secret cells within these organizations as well as Operation Dunstable. Each area would be split into zones and districts with instructors attached to each. Carry out propaganda activities to maintain morale of polish workers and demoralize the German workmen. L/Cpl. Ilkow, Stanislaw W/T � Troy 29 Escaped from Poland via Switzerland and France. Was in German concentration camp before posting to S.T.S63. 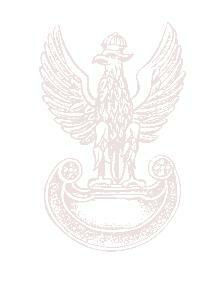 , Finished courses at S.T.S24a and W/T at S.T.S 63. Does not speak German well. Volunteered. Cpl. Ortyl, Jan Gamma 11 Ex-Bardsea, , Finished courses at S.T.S24a and S.T.S 63. W/T completed at S.T.S 53. Does not speak German. 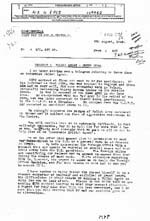 Records show both the Dunstable and Bardsea troops trained together and that under the direction of Major Kowalski completed a special training exercise in Brighton from 2-4th October 1944. The exact nature of the exercise is not disclosed. However, Colonel Hazell had suggested another 100 men were needed for this operation and any Bardsea teams not employed could be transferred despite S.T.S 63 having inadequate space to accommodate this number of personnel after some had been posted for training in Group B School. The training schedule was completed on 4th February 1945and signed off by Company Commander Captain Stepien. Their training included night exercises using 2 or 3 three ton trucks and medical lecturers to assist their survival chances in the field. 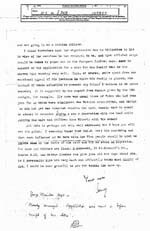 A letter dated 22nd December 1944 from Lt. Colonel Dasher (US MI) to Colonel J. Lunkiewicz indicates Dunstable teams were in the field in the US Zone in Europe and based in Dinant. While the contents cover logistical issues, the US clearly admired the quality and well organized operation, which would not be interfered with by the Supreme HQ. However, by February 1945 progress in Europe meant the full company may not be effectively ready to complete their original task. It was suggested the company would be split into 6 sections headed by an officer with one W/T operator attached to the section. Their tasks would be reallocated to include small commando raids deep into enemy territory (deeper than S.P.U 22) or selected Polish POW camps. Here they would protect the prisoners until the allies reached them. Records of the Dunstable Operation become sketchy and inconsistent in terms of revealing activity. 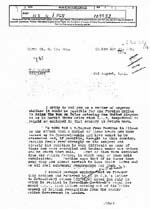 In the archives a report by Christopher Warner, C.M.G of the Foreign Office dated 1st August 1945 (PRO/HS4/268/109952) reveals the impending problems caused by the collapse of the Third Reich. The report indicated eighty-six stranded agents needed repatriation to the UK. The size of the problem becomes clear simply through their geographic spread. Many of the agents had been in prison or in concentration camps and although twenty-two had already made it back to the UK, there were logistical problems. Eight were in Brussels and three in Paris, leaving around fifty in the �system�, but had not reported themselves to the authorities. In addition, the Polish VIth Bureau wanted the Paris based agents returned quickly so that they could close down the post. Concerns were raised about the number of agents in various parts of Europe �turning up�. Colonel Perkins was embarrassed by being left with six agents held up at Pilsen who were a Polish Ministry of Interior agent (sent to Poland in 1943) accompanied by his wife, two Polish Consular officials and one wife, and Mme Razska wife of Air Commodore Razska who was the Polish Air Force liaison officer assisting operations in Italy. It appears from correspondence; Mme Razska�s ability to enter the UK would be turned down until the British Government had made a ruling on the resettlement of Poles irrespective of the courage or dangers they had shown while in service. Agent LIBRACH who had been instrumental in the setting up of operations in France was having difficulty in obtaining permits for former agents to be resettled abroad, particularly France where eight female agents were barred from returning. The resettlement issue and the withdrawal in recognition of the Polish Government in London was one of the low points of Anglo-Polish politics and today remains embarrassing � a hurt that will not easily purged. A response to Warner�s report clearly revealed the British duplicity. More agents attached to SOE had arrived in Pilsen causing further embarrassment to Col. Perkins. The absurdity of the British Government was revealed in the following story revealed in a Top Secret cipher. 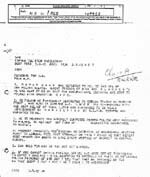 A cipher dated 03.08.45 from �Chequebook� (PRO/HS4/268/109952) reveals the fate of an agent Peter Czes. To avoid further issue, the cipher revealed Peter Czes would be sent to Paris or Brussels in the guise as a former POW to circumvent the blockade or veto on returning agents. A subsequent cipher made the order for Peter Czes to report to 62 Rue du Faubourg, St. Honore in Paris. However, this was not before numerous interdepartmental memos either upholding the veto or trying to renegotiate conditions for return. The spill-over included the Foreign Office and the OSS as Pilsen was under US control with the final word being left to the Home Office. The situation became increasingly desperate and placed these agents in real danger. A cipher dated 11.08.45 indicated the 2nd Parachute Regiment could be used to force the displaced agents and Polish service personnel in Pilsen across the border into Poland. Luckily, there was only one officer and a W/T operator spare and the OSS were over stretched. The order was never carried out. How fast the tables had turned ! On 21st August 1945 the Anglo-Polish Liquidation Committee and the Polish Armed Forces Committee were set up to settle all matters relating to the Polish Government in Exile. A key task of both committees was to sort out those who still required repatriation or had decided to emigrate. Count Raczynski would act as liaison between the British and Polish governments. While orders were issued to return agents to Britain, individual cases still caused concern. A cipher dated 22nd August indicated only one agent SAMOTUS and his wife were being held in Pilsen. All others were heading west via Bavaria for Britain with the debate about visas still raging between different departments. A cable from the British Ambassador in Moscow (PRO/HS4/268/109952) revealed the delicate case of a Polish officer who had been caught by the NKVD. Known as Captain Alun Morgan, the Embassy lobbied for his release and succeeded in getting him back to Britain on the Ambassadors special flight. However, the archive reveals there may have been others held with requests to clarify the names of those held made to V. Yerofeev of the People�s Commissariat for foreign Affairs in Moscow. The resettlement period was not without complication for returning agents. 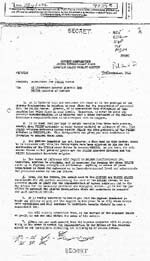 The debriefing and return to �normal� duties at times must have appeared petty in light of the war almost over without considering the personal risk and sacrifices made. Many agents had taken their salaries into the field � for what purposes we will never know, but most likely to be passed on to family. In the field the ground commanders often �confiscated� the money to help pay for the unit. On return to Britain, many agents were destitute. A letter dated 25th October 1945 (PRO/ HS4/268/109952) from a British officer (no name) on leave in Penrhyndeudraeth, North Wales highlights the difficulties the agents faced. Lieut. Makowski had trained and then served in the Polish Special Forces (Drogi Cichociemnych). Dressed in British uniform with false papers, he had worked behind the lines in Italy and Greece with Force 139. His duties in Greece were to destabilise the stretched German Army and had been based with the Greek Royalists. Pulled out of Greece, Lieut. Makowski was designated to follow up the FRESTON operation in southern Poland, but the Soviet Army had over-ran the area and the operation was cancelled. Having fought with the Greek Loyalists, Makowski and his family would on return to Poland face life sentences in Siberia. The author of the letter confesses to finding it difficult to pin bravery awards on one hand and with the other give a death sentence. 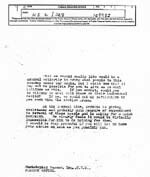 The letter begs the recipient to contact a Major George Klauber to verify the case. Lieut. Makowski lived at 10 St. Leonards Road, London W.13 and a pencilled note indicates he was allowed to stay in Britain.